If you live in Philly, it's more than likely you've been asked that age-old question. "Where's the best Philly cheese steak?" Brushing aside any distaste one might have for immediately associating Philly with cheese steaks, if you don't answer Pat's or Geno's, you're off to a great start. 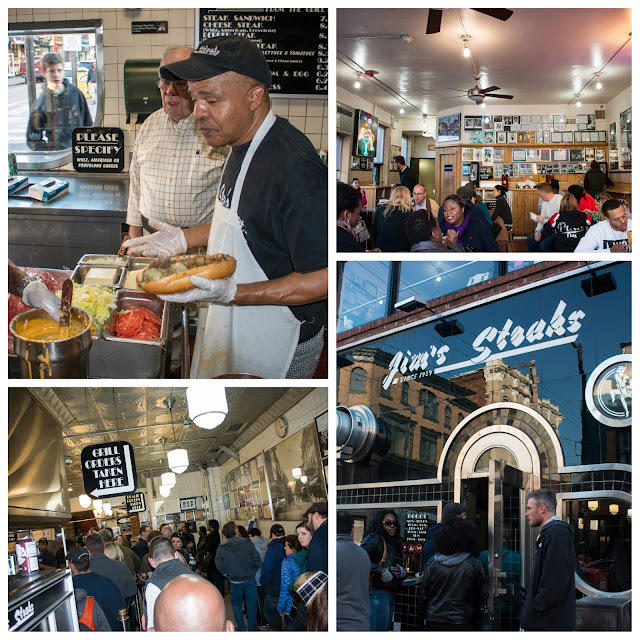 And while there are plenty of mom and pop shops offering great cheese steaks, if you settle on either Jim's, John's Roast Pork, or Ishkabibble's, you're a winner in my book! Jim and Millie starting serving their sandwiches out of their West Philly row home in the 1930's. From there, the business was sold to Bill Proetto in the 70's and settled at the current South Street institution. 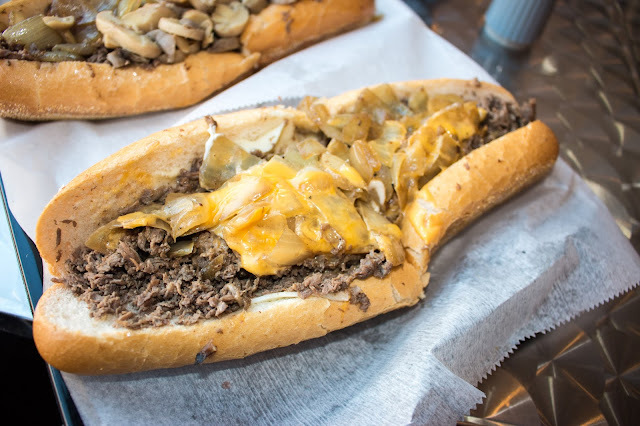 The cheese steaks are so popular that business has now expanded to Northeast Philly and Springfield, PA as well. Lines regularly go out the door, but even so, the wait is usually less than 10 minutes. Efficiency they have down pat. 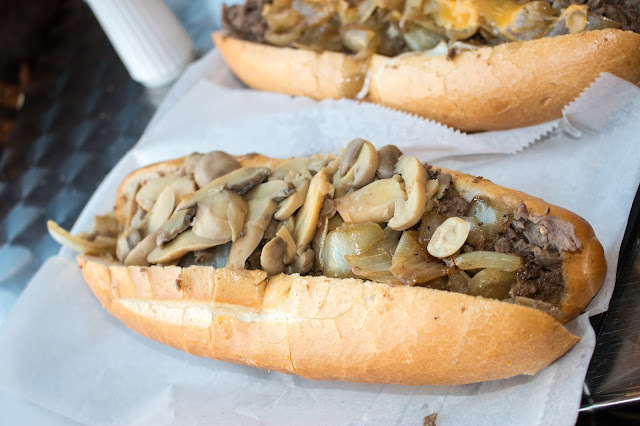 For a proper cheese steak, you start with great bread. Amoroso's is a standout - the bread is crusty, pliant, and a great vessel for the nicely seasoned and chopped steak. The GF got hers 'wit onions (you can get them grilled, raw, or both), creamy Whiz, and plenty of roasted mushrooms. Made for a juicy and messy bite. I love going cheesy so I had them make mine with both creamy American and a healthy dollop of Cheese Whiz. It may look messy, but the roll does a great job of containing this beast of a feast. 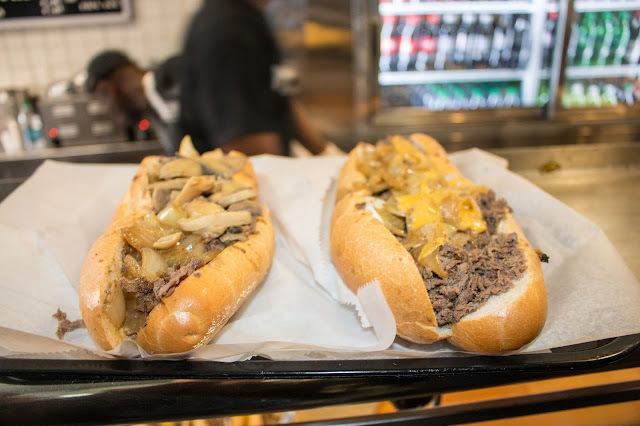 You'll leave the shop smelling like grilled onions and steak for days, but you'll have a belly full of a cheese steak that does Philly proud.